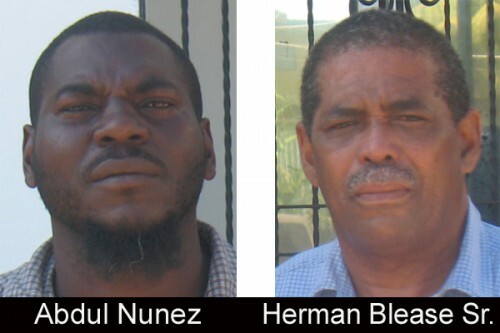 President of the National Trade Union Congress of Belize (NTUCB), Dylan Reneau, told Amandala tonight that they plan to respond urgently to reports of staff firings at the Belize Central Prison, under the management of the Kolbe Foundation. Reneau went further to say, however, that the NTUCB would also be challenging the continued privatization of the prison, as it is an important factor that appears to be impacting the crime situation in Belize. Amandala was told that on Tuesday, March 12, right after the holiday weekend, a couple who had been employed as security staff at the prison were terminated. Collive and Carol Casimiro had been working at the prison for 7 and 9 years, respectively. “We have to look keenly at the case of Mister and Misses Casimiro to see how we can try and reverse that situation,” Reneau told Amandala tonight. Whereas Casimiro told us they were fired, a prison official told us that they resigned. Reneau spoke to us after hearing a presentation from Herman Blease, Sr., who told our newspaper that he was terminated last October. Amandala also had a chance to speak with Abdul Nunez, who said he walked off the job less than two weeks ago, because of what has been transpiring at the prison. President of the Belize Energy Workers Union, Marvin Mora, said that the killings continue because there is no real dire consequence. Concerns were raised at the meeting that certain inmates have special privileges and are assigned special jobs that they should, for security purposes, not have. They also said that some inmates get to spend weekends out of jail, and quite a few get to work off the compound for financial incentives, including doing personal work for high-ranking staff. “This presentation gives us some hard and cold facts about what is happening within the prison and how it has been a corrupt system, and certainly the trade union movement has got to champion this cause because I think, while one of the union leaders mentioned that we have been blaming the violence and everything else, we’ve never blamed this corrupt system that is at the prison for some of our ills within the society,” Reneau told Amandala. Government will be reluctant to change things, because it does not want to admit that it has done wrong by privatizing the prison, said Mora, pointing to what has transpired with the privatization of the Belize Electricity Limited, the Belize Telemedia Limited and the Belize Water Services Limited. Mora urged the union to garner the support of workers and the NGO community. Government won’t change with talk, but when we show them we are serious, said Mora. “They are just loud mouth, and went of their own free will,” said Woods. Woods said that the Casimiro couple left of their own volition and they submitted resignations on Tuesday. We asked if we could see those letters. He went on to say that the prison is independently audited. “We are constantly in state of alert. The prison is not the nicest place to work. As far as there being a hidden agenda and cover-up, that’s the biggest bunch of garbage,” said Woods. We told Woods that normally when people leave their jobs because they were fed up, they don’t go seek union representation. He said that the prison staff is about 275 workers, and 4 or 5 resigned over the last month and a half, but there were no terminations during that period, said Woods. What about Herman Blease, Sr.? In answer to this question, Woods said that Blease was hired for a specific project, to prepare the operations manual, and he worked two years doing it and when he was finished, they had nothing else for him to do and paid him off. Reneau said tonight that the NTUCB would be seeking an audience with Prime Minister Dean Barrow to discuss the status of the prison and its workers.